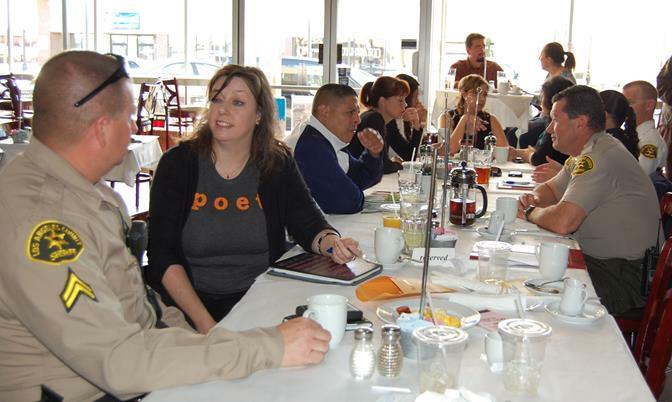 The Lancaster Sheriff’s Station’s Coffee with a Deputy meeting was held at 8 a.m., Thursday, Feb. 13 at the Lemon Leaf Cafe on The BLVD. LANCASTER – More than a dozen local residents joined Lancaster Sheriff’s deputies and representatives from the city’s Public Safety office Thursday morning for the “Coffee with a Deputy” meeting. 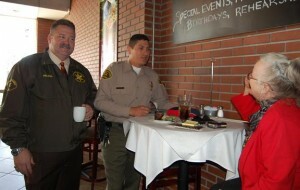 Captain Pat Nelson (left) and Deputy Ruiz shares a conversation with an attendee. The informal meetings are a chance for residents to meet with local law enforcement to discuss community issues, build relationships, and drink coffee. “Anything from, ‘my neighbor dumps his trash in my trash can’, to ‘what do I do about the neighbor’s dog’, to ‘there’s graffiti that’s been appearing in my neighborhood’… that kind of thing,” said Lancaster Sheriff’s Station Captain Pat Nelson, when asked about the issues he hears at Coffee with a Deputy meetings. Lancaster resident Willie Green (left) said the monthly meetings keep him informed about public safety issues in the city. April Barr has been a regular at the monthly meetings since Coffee with a Deputy launched in Lancaster nearly two years ago. “It gives us a chance to meet the officers that are working with the city and to get a feel for the whole city, not just our area,” Barr said. She said the meetings have allowed her the opportunity to work with deputies and city officials to address various quality of life concerns in her neighborhood. “We had a big problem with people dumping trash in the dirt area,” Barr said, adding that the problem has since been addressed. “They actually go in and dig through the trash, find out who dumped it and go file charges,” Barr said. Willie Green said he regularly attends the Coffee with a Deputy meetings so that he is better prepared in his role as Neighborhood Watch Block Captain. 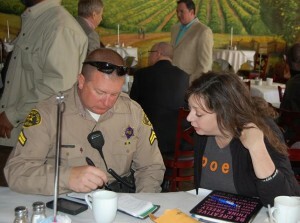 Deputy Addington (left) is the deputy specially assigned to handle public safety issues on The BLVD. 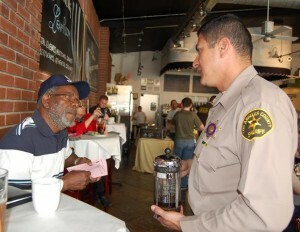 Coffee with a Deputy was launched as an informal forum for residents to build relationships with law enforcement. The meetings have since evolved into a community network, with residents building relationships with each other, Nelson explained. 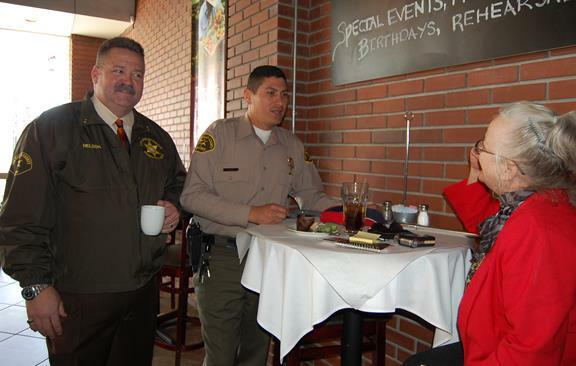 The Lancaster Sheriff’s Station’s next ‘Coffee with a Deputy’ meeting will be held at 8 a.m., Thursday, March 13, at the Lemon Leaf Café, located at 653 West Lancaster Boulevard in Lancaster.